There are a number of useful resources on the web for studying Southern Pacific history. One site I came across was devoted entirely to a single locomotive, GP9 #5623. 5623 was bought surplus and completely restored by two dedicated SP railfans and it currently is stationed on the Niles Canyon Railway. She is a beautiful engine painted in the Black Widow scheme. 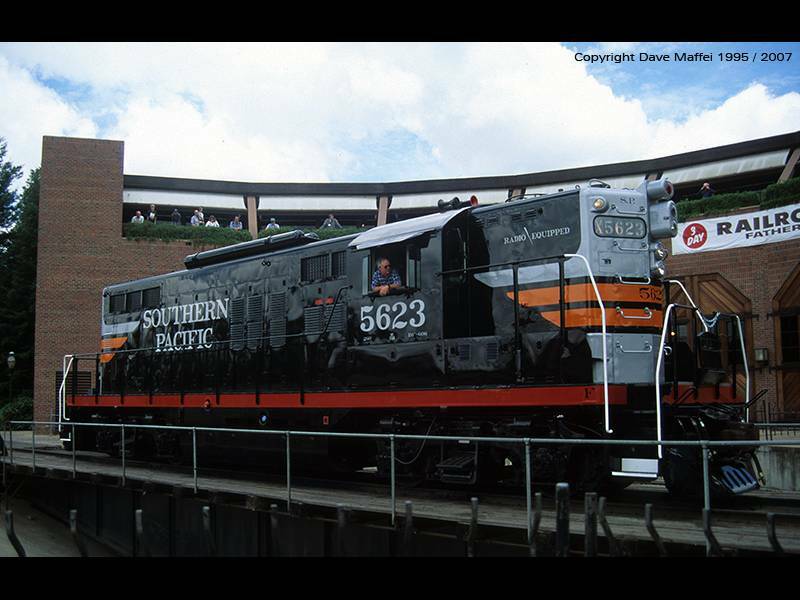 5623 was a passenger GP9 and has the air tanks mounted on top of the long hood which allowed her to carry more fuel. This type of GP9 with the air tanks on the roof were nicknamed "torpedo boats" for the similarity to a PT boat. Passenger GP9s were equipped with a steam boiler in the short hood. 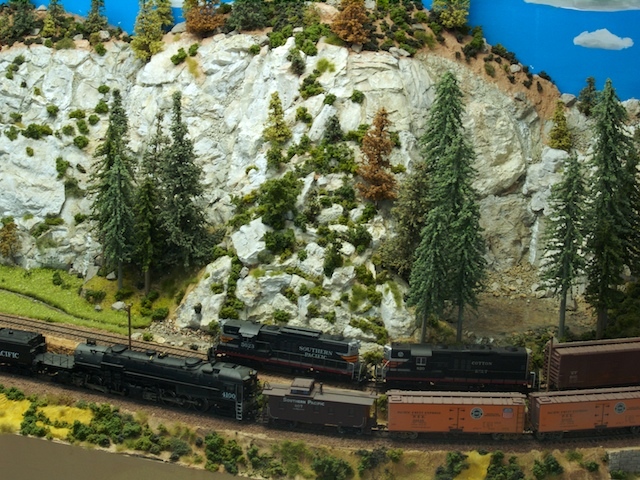 I was inspired to build a model of 5623 for the Tam Valley RR to run short passenger trains. Since there were no commercially available models, I started with a Proto 2K GP9 w/o dynamic brakes that was painted and lettered for a different railroad. I installed a new headlight package and the steam boiler vent. I ordered the proper wagon-wheel antenna, but unfortunately the manufacturer appears to be out of business so it never came and I was unable to install this minor detail. I took the shell apart and spray painted everything engine black after carefully removing the windows. I then masked off the front of the hoods and painted them silver. I used decals to apply the black widow stripes, the numbering and the road name as well as the �Radio Equipped� logo on the short hood. I didn�t weather the locomotive so it would look newly restored. Also, passenger engines were actually washed every once in a while unlike the SP freight engines. This was the first time I ever painted and lettered a locomotive myself and I found it a very satisfying project. I have a lot more fun running this engine knowing that I did the paint job and knowing the specific history of the engine! Pair of geeps with 5623 leading passing AC4 4100 in reefer block helper service. You can see the difference between 5623 a torpedo boat and 420, a freight geep with dynamic brakes.